Usually when Intel or AMD release a new mainstream CPU family, they do so with a slew of new chipsets. For example, the 7th generation Core series codenamed 'Kaby Lake' hit the ground running with 5 supporting chipsets, 3 of which you’re probably quite familiar with. AMD also released Ryzen with 3 desktop chipsets, the A320, B350 and X370. But when Intel raced out the 8th-gen Core series 'Coffee Lake' late last year, they did so with a single chipset, the high-end Z370. This meant up until today, the most affordable Intel 300-series motherboard you could get your hands on cost around $110. Now, some six months later Intel is ready to unleash their more budget friendly chipsets which includes the B360. We also have a few H370 boards on hand, but today we’re focusing on the slightly more affordable B360 boards. So when compared to the Z370 boards we already have, what’s missing from these cheaper B360 boards? Well, for starters B360 boards don’t support CPU or memory overclocking, even with an unlocked-K processor. This means auto overclocking features such as Multicore Enhancement don’t exist either. They also don’t support RAID, offer fewer PCIe lanes to the CPU, less USB ports -- though the B360 chipset does introduce native USB 3.1 Gen 2 ports, something the Z370 chipset lacks entirely. Also Z370 boards can support up to three M.2 ports, but the B360 is limited to a single port. The B360 chipset doesn’t support DDR4 memory overclocking and as such is limited to the maximum frequency supported by the Integrated Memory Controller. This means all Core i5 and Core i7 models can run at up to DDR4-2666, while the Core i3 models are limited to DDR4-2400. B360 boards do support XMP, but if you use modules with a DDR4-3000 profile as an example, when you load the profile it will load the timings associated with the 3000 spec, but only run at 2666 or 2400 depending on the CPU used. MSI has kindly provided us with two new B360 motherboards for testing. They say that on their own internal testing they’ve seen no difference in performance between B360 and Z370 motherboards, basing this claim on tests performed with their top-end model, the Gaming Pro Carbon using the Core i7-8700K. We were interested in testing more affordable models, so we requested the B360 Gaming Plus and the dinky little B360M PRO-VD, which forgoes VRM cooling entirely. Leading up to the release of budget 300-series chipsets, there were concerns that the 6-core parts wouldn’t be able to deliver the same level of performance on these more affordable motherboards when compared to what we were seeing on Z370 models. MSI is confident this isn’t the case with their premium B360 model, the Gaming Pro Carbon, a $140 motherboard, but what about the more affordable $115 B360 Gaming Plus? Let’s take a look by comparing the Core i7-8700 and Core i5-8400 on this new B360 board against the MSI Z370 Godlike, you know the one that costs $500+. First up is a look at memory bandwidth performance and as you can see all test configurations used DDR4-2666 memory, the highest spec supported by the B360 chipset when using a Core i5 or i7 processor. The Z370 board can utilize higher spec memory with these processors, but let’s not worry about that for now. As you can see performance is exactly the same using either the Z370 or B360 board. Moving on here are the Cinebench R15 multi-threaded scores and starting with the Core i5-8400 we see that it delivers the same score on both boards using the box cooler, also note this CPU is no faster using aftermarket cooling, when testing with an ambient air temperature of 21 degrees. It’s a different story with the Core i7-8700 though, using the box cooler we see the same performance on both the B360 and Z370 boards. However if we install a tower style air cooler the score is increased by 5% as the i7-8700 goes from an all-core turbo frequency of 4.1 GHz to 4.3 GHz, as thermal throttling is no longer an issue. This performance uplift was seen on the B360 board, but it’s exactly the same result on the Z370 model as well. Using the Corona benchmark we see similar performance with both the 8400 and 8700 using either chipset. It’s the same story when testing with POVray and here we see with a better cooler the render time was reduced by a 2% margin with the Core i7-8700. More of the same is seen when testing with Blender. so I’m going to wrap up the application testing here and check out a few games. Here we see when playing Battlefield 1 the experience is the same on the B360 board as it is on the Z370. Please note here we are looking a the the 1% low frame time performance, which has been converted to an FPS metric. Similar results were found when testing with Far Cry 5, the difference between the two motherboards can be chocked up to the margin of error. This is an interesting result, the feature rich Z370 Godlike is significantly more power hungry than the B360 Gaming Plus. Total system consumption for the Core i5-8400 was reduced by 25% with the B360 board while the 8700 saw a 13% reduction in consumption. So it seems these cheaper motherboards are going to help improve the performance per watt rating of Intel 6-core CPUs. So the MSI B360 Gaming Plus had no trouble matching an extreme Z370 motherboard with locked Coffee Lake CPUs. Of course, both boards were intentionally limited to DDR4-2666 memory. The Z370 board will pull away in certain workloads and games when paired with higher frequency memory, that's a given. As noted earlier, MSI suggests that the B360 Gaming Plus will retail for $115 and that places around the cheapest Z370 boards on the market. MSI’s own Z370 Gaming Plus costs just $130 and for the price of a cheap meal you do get quite a few extras, not least of which is CPU and memory overclocking. So ideally B360 shoppers will want to spend less. We might have overachieved here but we convinced MSI to hand over their B360M PRO-VD, which they say will come in at $85, though that is the suggested price and it will likely cost less than that, at least we really hope it will. For that same money you can get the MSI B250M Mortar and that’s a significantly higher quality motherboard, so realistically we're thinking more like $60 - $70, we’ll have to see where pricing heads over the next few weeks. What we can tell you is that the B360M PRO-VD is a super basic motherboard and is the most affordable model MSI will be offering in the B360 range. Besides basic chipset features, nothing extra has been added to this tiny Micro ATX board, there’s just two DIMM slots, no VRM cooling of any kind and no HDMI or Displayport connectivity. There are none of the natively supported USB 3.1 Gen 2 ports, just the six Gen 1 ports along with half a dozen USB 2.0 ports. MSI has included an M.2 port though, which is kind of nice, though we're not sure how many users seeking an ultra affordable B360 board will be using M.2 storage, but it’s there if needed. Now the VRM is the most concerning aspect of this board, but before getting too carried away, we do realize there aren’t many, if any of you reading this article who plan to stick a $300 Core i7 processor on a sub-$100 motherboard. The B360M PRO-VD is more of your Core i3-8100 type motherboard, maybe a Core i5-8400, but probably not a Core i7-8700. Still we wanted to see how the 8700 got on so this is where we started. 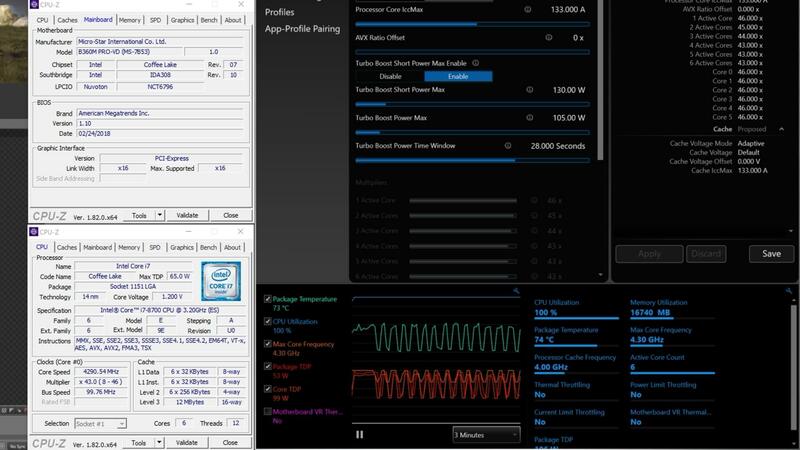 Loading up Intel XTU software we can already see that the MSI B360 PRO-VD has been downgraded to a 65 watt maximum turbo boost power draw and with maximum short power draw of 82 watts. In comparison, the B360 Gaming Plus was configured for 95 watts and 119 watts. So this 31% downgrade in power delivery is no doubt going to impact the Core i7-8700 though it shouldn’t hurt the Core i5-8400. Firing up Cinebench R15 the 8700 scored just 1211pts, but ignoring that run and taking the average from four more runs resulted in a score of 1160 pts. Please note we're using the DeepCool Gammaxx 200T, we know what the deal is with the crappy box cooler, so let’s remove the thermal throttling variable from these results. So that score is 16% down on what we saw with the MSI B360 Gaming Plus. 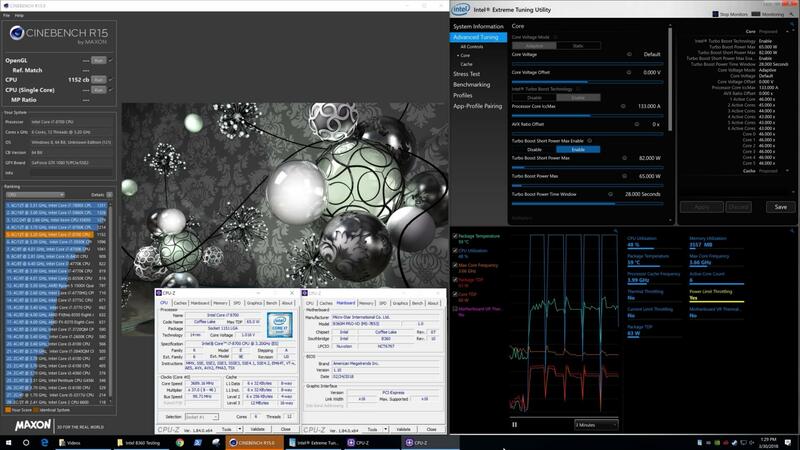 Adjusting the Turbo Boost parameters in the XTU software to match that of the B360 Gaming Plus we run Cinebench R15 four more times. The B360 PRO-VD now allowed for a score of over 1350 pts and that’s within the ballpark of what we were getting with the Gaming Plus, not quite as good but with just under 2% in it, we’ll call that margin of error. We could increase the turbo boost settings in the XTU software further, but a long run stress test reveals why that’s only beneficial for short benchmarks. Here we have a complex Blender workload and just 30 seconds in we run into a bit of a hiccup. Everything looks great for the first 30 seconds, the 8700 holds 4.3 GHz on all 6-cores and we ripping through this workload. Then like that the motherboard winds the 8700 back down to 3.2 GHz for 7 seconds before cranking back up to 4.3 GHz for 8 seconds and then repeating the process. The reason this is happening is because the motherboards VRM is overheating, or at least reaching the thermal limit, it then backs off the Core i7-8700’s power draw, cools a few degrees over a 7 second period and then ramps power delivery back up until the thermal limit of the VRM is once again reached, which as I just said took about 8 seconds. Without sticking some kind of heatsink on the MOSFETS, it’s not possible to avoid this throttling issue with the Core i7-8700. MSI isn’t expecting too many people to pair this processor with their cheapest B360 motherboard and even if you do it works without an issue, it’s just slower than a board with ample cooling. But what about a high-end CPU your more likely to pair with a budget board, something like the Core i5-8400? Without making any alterations to the B360 PRO-VD’s configuration the Core i5-8400 scores 877 pts on its fourth pass which is on par with what we saw from the Z370 Godlike. That’s great, but what about a long run test? Time to fire up Blender again. With a 65 watt package TDP ceiling the Core i5-8400 left us with room to spare, only peaking at 62 watts briefly now and then. 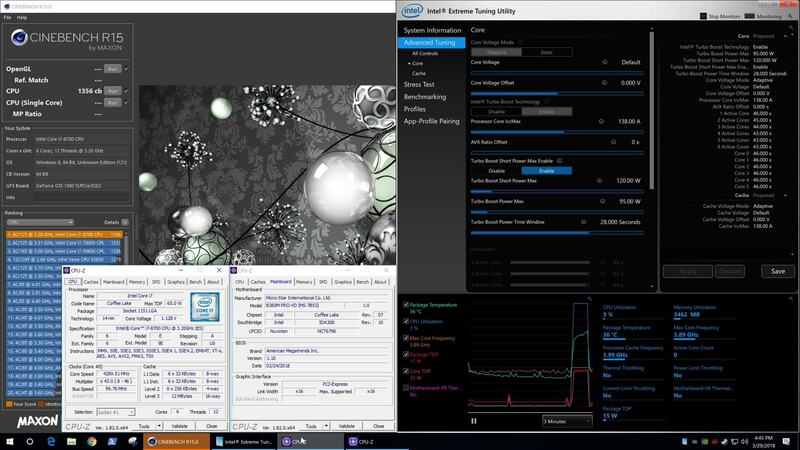 For the entire test which ran for over an hour the 8400 held a constant 3.8 GHz without flinching for a second. The Gammaxx 200T keep the CPU very cool at under 60 degrees and we never saw throttling of any kind. This means ultra budget boards like the MSI B360 PRO-VD are perfect for use with locked Core i5 processors such as the 8400. While it will work fine with the Core i7-8700, without upgrading the cooling you can expect to receive up to a 20% performance hit. This is based on a single affordable B360 board so far, we’ll update you if needed as more boards come in. For now it’s safe to conclude that anyone wanting to build a Core i5-8400 rig on a strict budget can do so with something like the MSI B360 PRO-VD, though we strongly suggest you consider something a little more upmarket like the B360 Gaming Plus if you're serious about your computing.